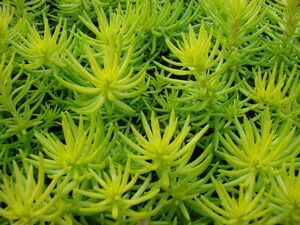 The evergreen needle-like leaves shine a brilliant golden yellow that grows to about 4” in full sun and well-drained soil. When the weather turns cooler, the tips of the leaves turn a reddish-orange tinge, which lasts all winter. Yellow flowers appear in early summer.